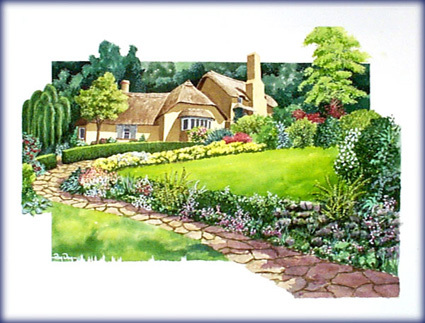 Print Size 17.5" x 20.5" - Image 14" x 17.5"
green hedgerows and tiny fields. Gold two inch frame measures: 23.5" X 27"
Inner mat: Flaxen (buff) . Print Size: 11.5" x 14" - Image Size: 9.5" x 11.8"
at their Lake District home in the north of England. 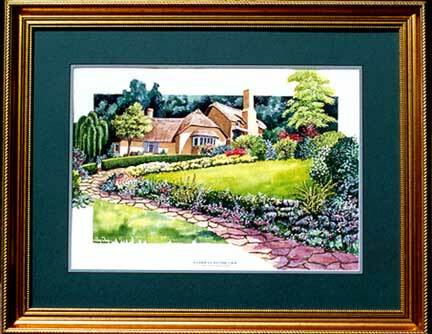 Gold 1.5 inch frame measures: 16.5" X19"
Print Size: 17.5" 23 - Image Size 14.5" x 20"
In a village built by a philanthropic landowner to house his estate workers, this picturesque cottage of cob and thatch is designed in the local "vernacular" style of the West country. Selworthy sits sheltered from the fierce Atlantic winds on the leeward side of the 1013 foot Selworthy beacon just north of Exmoor. 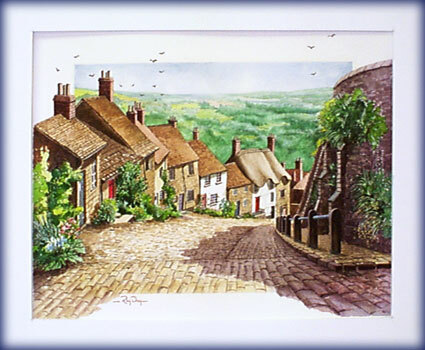 The entire Somerset village reflects a romantic image of English rural life in medieval times. 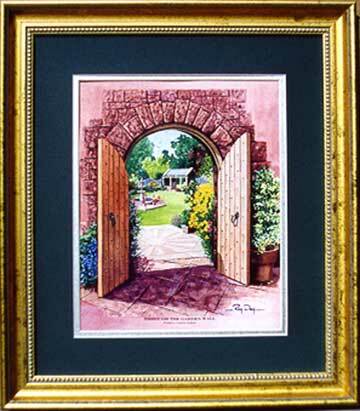 Two inch Gold Frame measures: 29.5" X 23.5"
produced by digital print technology. 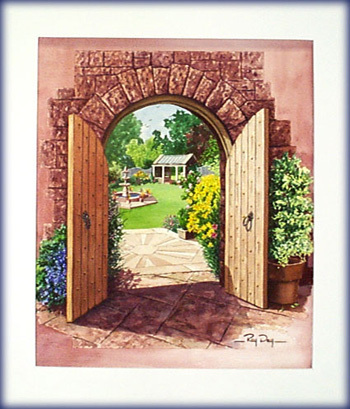 Collectors of Giclée prints are assured a reproduction as close to the original artwork as technology will allow along with superior archival standards demanded by the Fine Art industry. The pigment-based UV-secure inks are applied to heavy weight, 100% cotton, acid-free paper. 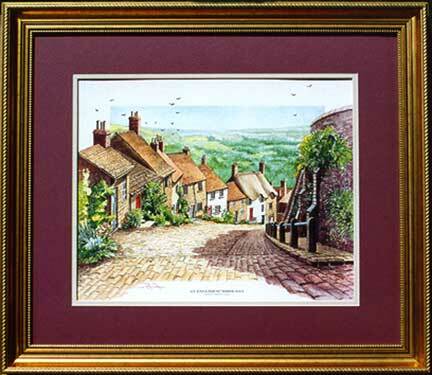 We are proud to offer The English Collection reproduced in the Fine Art of Giclée digital technology. confirms it a valid publication. An Artist Proof edition of 50 reproductions is personally signed by Ray Day. These are distributed at the artists' discretion, however, some are usually available for public sale. and numbered with Roman Numerals. Ray Day has personally signed a special Charity Edition of 25 prints - numbered and designated by the letters C/E. Charity Edition prints are not for sale to the public.